Before you start, make sure the canister of your ice cream maker is frozen. To freeze completely, the canister should be in the freezer for at least 6 hours before you attempt to churn your ice cream. Make the ice cream base. In a heavy bottom saucepan over medium-high heat, combine the milk, heavy cream, brown sugar and vanilla extract. Bring the mixture to a low boil. It will appear slightly curdled, but that’s totally normal. Don’t worry and keep going! Meanwhile, in a separate bowl, whisk together the egg yolks, granulated sugar and salt until the egg yolks become pale yellow and slightly thickened. Temper the egg yolks by whisking about a 1/2 cup of the warm milk/cream/brown sugar mixture into the egg yolks. Then whisk the tempered egg yolks back into the saucepan with the remaining milk/cream/brown sugar mixture. Cook over medium heat, stirring constantly, until the ice cream base thickens and coats the back of a spoon, about 2-3 minutes. Remove from the heat. Strain through a fine-mesh sieve into a clean bowl. Cover with plastic wrap, pushing it all the way down so it touches the surface of the ice cream base to prevent a skin from forming. Refrigerate until chilled, at least 4 hours or up to 24 hours. *Once completely chilled, pour the ice cream base into the canister of your ice cream maker along with the bourbon. Churn until the mixture is nearly frozen and the consistency of soft serve, about 20 minutes. Add the dark chocolate and churn for another 2-3 minutes to evenly distribute the chocolate. Transfer the ice cream to a freezer-safe container and place in your freezer. The ice cream should become firm in about 4 hours. Enjoy! Don’t have an ice cream maker? No problem! 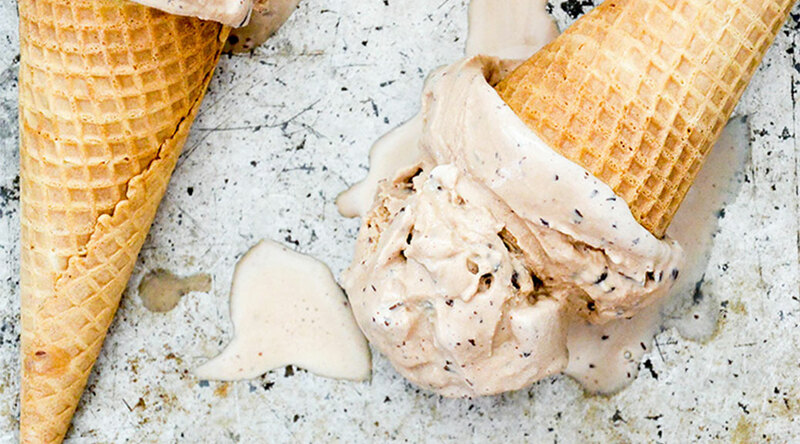 Click here to learn how to make ice cream without an ice cream maker.